Note: I cover this topic and many others in my course, **Hands on .Net Core** at Udemy. Check it out! So let's walk through building Unit Tests for .Net core apps. For this tutorial we'll build a simple class library called "string modifier". As the name suggests, it will be used to modify strings. 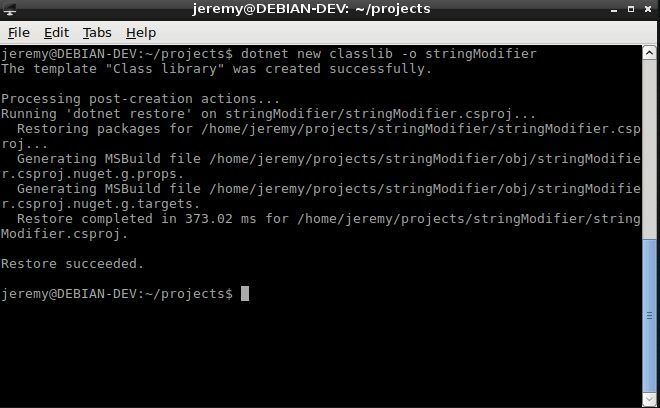 We'll use the .NET Core CLI to create a new class library. 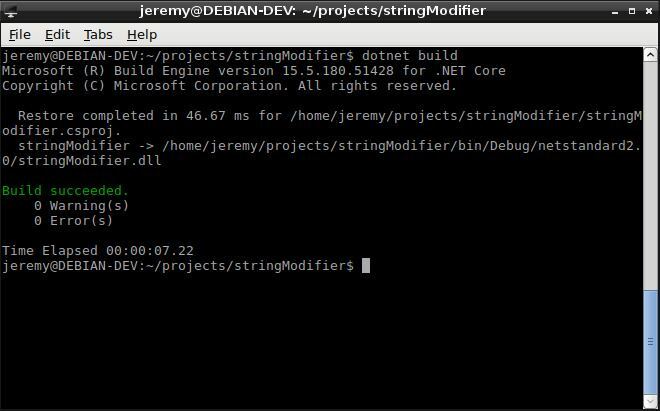 This uses the dotnet CLI to create a new class library in the folder named stringModifier. It creates an application that is essentially just a basic class. We're going to name this something a bit more useful though. We're going to create a library that modifies strings for us, so let's add a couple methods to our string modifier library. This method will make any string you send it all uppercase. Now these are obviously for demo purposes and easy to see what they do, but let's do a quick smoke test with them. Let's build a quick console application that calls the class library just to do a quick visual test of functionality. Exit out of the project folder, and we want to use the dotnet CLI to create a runner for this. Now we can verify that the methods work as we expect them to. But we'll add some unit tests to be sure. Remember: Unit tests are not just to check the individual functionality of a method. They also check the functionality does not change when other parts of the application change. This is part of what makes them so important. Let's build a separate project for the unit tests. This is the project you'll run after a build, or preferably automatically on a build server every time you deploy. 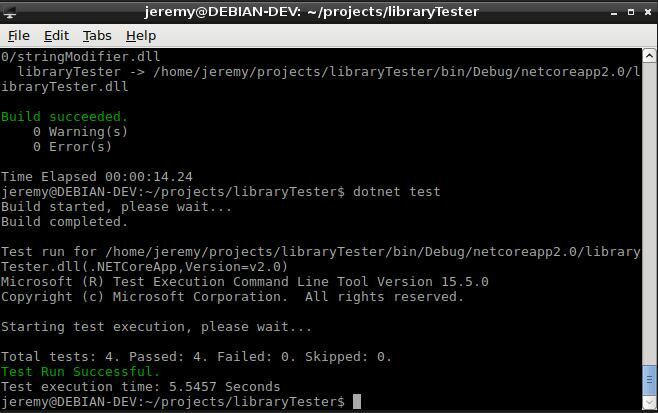 Exit out of the directory you were just in and let's use the dotnet CLI to create yet another project. This will be an MSTEST Unit Test project. This creates a unit test project in the libraryTester directory. Now we open up UnitTest1.cs, and this should look really familiar to you if you've built unit tests before. This looks identical to tests in conventional .Net. So let's add a couple tests. First we need to add a using statement to include the library. Next we want to test the actual functionality of the methods. So we have a couple test cases here to do that. Now what we are doing here is asserting what we expect the method to return, and then inserting test string in the method to see if it matches what we expect. These are some pretty basic tests, but should be good for now. Let's try it out. Now we're in the library tester folder, and In order to build this, we'll have to add a reference again. Now let's test the build. It looks like we don't have any failures here so we should be good to go. And our tests are successful! We can see that 4 tests were run and everything is green. Now, let's break a test just to see what that looks like. Let's refactor the method to pass through the string instead of making it upper case. Save it and build it. And now we have a failure. As you can see by the splash of red on the screen it threw an error. It expected test string to be in all caps, and it's not. This is a great feature of unit tests, if some yahoo goes in and refactors something and breaks the functionality, your test will pick it up right away. This is how easy it is to build unit tests in .NET Core!! Unit tests are super important. I'm not going to use this tutorial as a lecture, but they're well worth your time and too frequently overlooked. 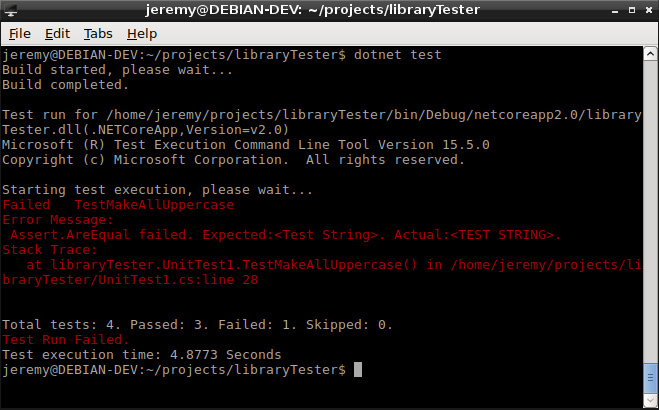 Just because you're developing .NET Core apps doesn't mean they can't be unit tested, MSTEST seems to work very well with everything I've done with it so far. So do it!! And as I mentioned I cover this and many other topics in my course, **Hands on .NET Core at Udemy** Click the link to check it out.